FYI: artHARLEM & HOAST sites have been hacked. We are trying to rectify and upload news of our demise. Seven years and six studio tours later we have decided, with heavy hearts, to dissolve artHARLEM and the production of the Harlem Open Artist Studio Tour(HOAST). As some of you already know from our hiatus in 2010, health emergencies surrounding our families have affected the time needed to produce artHARLEM gatherings and exhibitions. We are, and have always been, a volunteer arts organization and so, the demands on our schedule these past two years have greatly hampered our ability to connect with the artists, galleries and fellow arts organizations that we have come to know as artists and curators who also live and work in the Harlem neighborhood. Now that we all know each other, attend our gallery openings and visit our respective studios, we look forward to a continued connection with you as the colleagues, neighbors and friends we have become. We feel blessed to have worked and collaborated with so many incredible and inspiring people. Be well and we hope to carry on with the conversations we began and the friendships that blossomed during the many gallery openings, studio visits and artHARLEM Artist Get Togethers we attended across this vibrant and diverse footprint. Please join us for the Open Art Studios weekend at Floor4Art, May 14 & 15 from 12 pm – 6:30 pm both days. Natalie Alarcón, Painting, Mixed media, Mary Bridgman, Painting/Oil on Canvas, Susan Carlo, Painting/Oil on Canvas, Ingrid Capozzoli Flinn, Painting/Work on Paper, Michael Fisher, Photography, Brian Patrick Kelly, Paintings & Prints, Norma Márquez Orozco, Drawing, mixed media, Karin Moggridge, Textile Art, Wall Hangings and Folding Screens, Anne Pomponio, Oil/mixed media, Anne Rodocanachi, Drawing/Charcoal on Paper, Robin Rule, Painting/Oil on Canvas, Mercer Tullis, Drawing, mixed media, Damian C. VanCamp, Photography, John VanCamp, Installation, mixed media, Pam White, Work on Paper/Gouache and Collage, Paula Wood, Painting/Oil, collage, mixed media, Cynthia Woodie, Sculpted jewelry, sculptor for the toy and giftware industry. Visit www.floor4art.com http://www.floor4art.com for more information. Please feel free to share with other this invite. 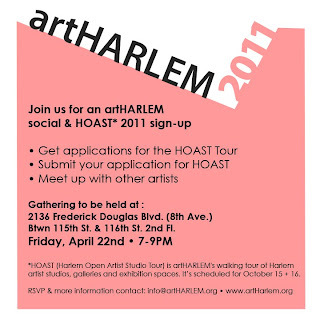 *HOAST (Harlem Open Artist Studio Tours) is artHARLEM's walking tour of Harlem artist, studios, galleries and exhibition spaces it's scheduled for October 15 + 16. Please feel free to forward this email to other interested artists and art related organizations. HOAST Featured in the Buffalo Examiner! 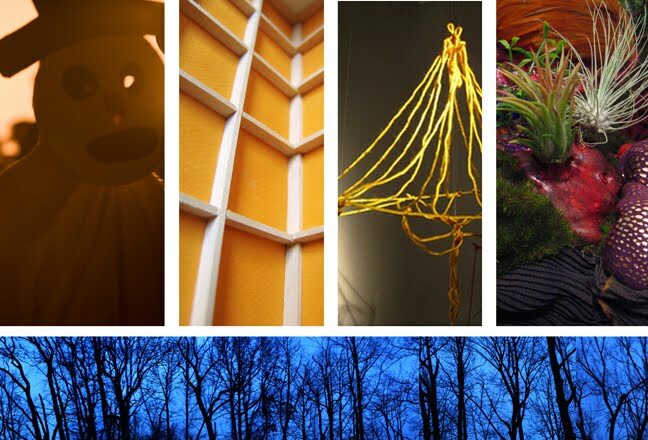 As HOAST2009 approaches, we want to extend a warm welcome to all the new artists, galleries and exhibition spaces that will be participating in our 5th annual studio tour weekend. 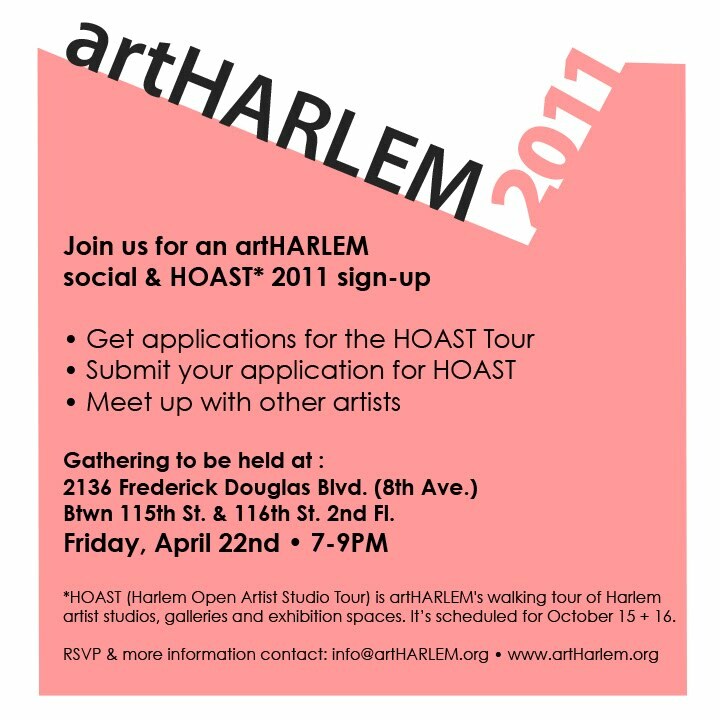 We are also pleased to welcome all returning artists, many of whom have participated in HOAST since the first studio tour in 2005. Artist James Horner wrote a wonderful piece for the Buffalo Examiner announcing HOAST2009. He highlights the work of artists, both old and new. Think Carnival and New Year's Eve. It is a brightly colored, curly strand of paper that is tossed in the air during celebrations and holidays. When hundreds of serpentinas unfurl at once, they cover everyone and everything in a woven mosaic of colors and textures. Dindga McCannon, The Laundromat Project, Paul Hunter, Daniel Baltzer, el_le project space, TAFA Studios, Gallery M, David Shrobe, The Harlem Girls Quilting Circle, Allicette Torres, Eric Alugas, Daina Shobrys, NoMa Photo Group, Eli Kince, Chashama Studios, Samir Amami, Shimoda Emanuel, Helen Dennis, Shani Peters and many others. For a complete list of HOAST2009 participating artists and exhibition spaces, please visit www.artharlem.org. The exhibition will be on view September 21 - October 21, 2009. An opening reception will be held on Friday, October 9th from 8-10pm. The reception will also serve as a kick-off party for HOAST2009.